The following is a guest post about home finances. If interested in submitting a guest post, please read my guest post policy and then contact me. The home is most people’s largest asset but it usually gets neglected from a financial management perspective. People naturally think of the home as a place to live, to entertain, to raise kids, and create memories. But it is important to turn our attention back to managing all your home finances from various aspects as it makes up a huge percentage of people’s assets and expenses. First is thinking about the home from an overall financial value. There are a few key figures that you should track such as the purchase price of the home, i.e. what was the agreed upon price you bought the home for. Next is to know what the tax assessed value is, as this is often times different and it is the value that your property taxes are based on. If you recently re-financed, you should also have an appraised value. You should also know your building insured value from your homeowner insurance policy in case of disaster. From a risk perspective, most people don’t know the total value of their possessions. As a result, they are usually under-insured especially due to collectibles and other expensive items that need a special rider. But adding up the value of all your items is not enough. You also need pictures, receipts and other documents for a home inventory as proof for reimbursement if a burglary, fire or other disaster were to happen, such as Hurricane Sandy, midwest and southern tornadoes, west coast wild fires and floods. Home maintenance “fix it” and replacement costs come as a big surprise to many people. Materials and equipment wear out and break down sooner than people expect because they forget the seasonal and annual maintenance tasks. Not performing these tasks also starts to erode the value of the home which can affect the selling price when people decide to sell the home. So budgeting for maintenance costs is not enough. Homeowners need a maintenance schedule for their home that reminds them of all these tasks because most people forget or they are not aware of all the things they should be doing. It is also important to track the actual costs as well as documents and receipts from third party service providers who often perform some of these tasks. Home improvement projects are a big part of many people’s homes. These projects have multiple financial perspectives that need to be managed. The first is creating a budget for all their desired projects. People end up being over-budget on projects because it is very often the first time they have ever managed one, like a bathroom or kitchen remodel. They don’t realize how many items they will need for these projects, they don’t shop for enough product alternatives, and they don’t balance what they want versus what they can afford. Tracking the actual costs of each home improvement project is also important to know the tax basis you have in the home, especially when you sell the home in the future. Another reason to track these costs is for insurance purposes. People are also under-insured because they improve their home, but they don’t update their home inventory and discuss these improvements with their insurance agent. In addition, having proof of these improvements can help justify your selling price for the home in the future. So with all these different financial aspects of home, how do people manage this asset? Many people use a combination of multiple spreadsheets and electronic and paper documents stored in multiple places. Many don’t use anything at all, yet this is their largest asset in their personal portfolio! HomeZada is a new online personal finance solution that is dedicated to managing the various financial aspects of a home. It is an all-in-one solution that manages the home asset values, the maintenance costs, the home improvement budgets, cash flows, costs and home inventory values. The solution helps consumers save money on managing the expense side of home, protects them from a risk perspective, and helps maintain or improve the asset value for future a re-sell. The solution goes beyond just the financial numbers. It provides an automated maintenance schedule of common tasks that people forget or are unaware of and alerts the homeowner when these things need to get done. It also provides a way to save online and offline shopping research for home improvement projects. It also is a data storage solution to save photos, documents and receipts for your home inventory and important property documents. You can learn more about the solution by visiting the HomeZada site. When it comes to managing money, the natural tendency is to manage your investment, retirement, credit, and bank accounts. 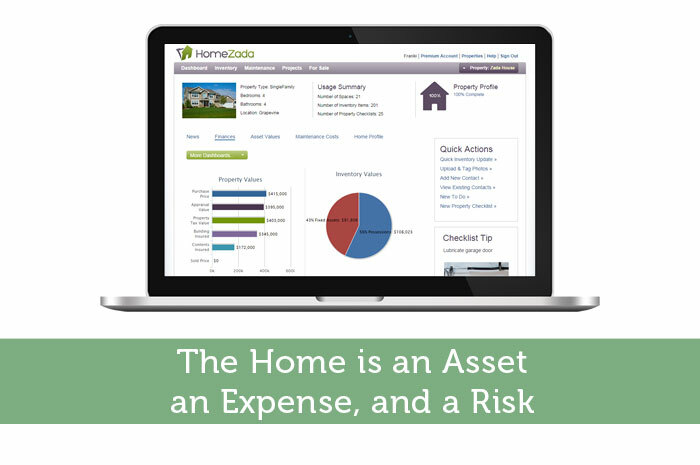 Isn’t it time to also have a solution to manage the expense, risk, and asset perspectives of your home? As a follow-up, it might be cool if you could touch base on other foreseeable expenses and their impact on your home. For example, when selling a home, especially in a down market or selling an older home, certain updates can be expected by the buyers, such as updated bathrooms, wall colors (including the elimination of wallpaper), fixture materials/looks, etc. If there’s a lot of competition in your market against newer, more upscale homes, you also have the chance to sell your home as a bargain alternative as long as you hit the right notes. People want the look and feel of the modern homes without the price tag, and they’ll be willing to skip on some things that they don’t have a good feel for how much they cost (for example, if you don’t have granite countertops, I have heard a lot of folks say, “that’s ok, i can just get those put in, in a few years,” when they really have no idea how expensive those upgrades can be). Great Article. HomeZada sounds like a very useful tool. I will be checking it out. Interesting tool. Since we are selling our home and buying another one, this tool might come in handy. Thanks for the info! I’m in the same boat as you. I’ll be checking this out as well! A home is the most expensive asset that most people will ever own. The best way to manage it is to avoid leveraging it with loans. This will greatly decrease costs DEBT,closing, costs, broker fees, etc. I’ve always been in a rush and felt under pressure to buy my first home but the more I read on it. The more I feel as though I’m not ready and should rent longer. I’m not financially secure enough to own a home for now. I think once my debt is paid off an emergency fund is needed before owning my first home. Great article! Owning a home is indeed both an asset and a liability for every one who has one. This sounds like an interesting tool. We don’t have a maintenance schedule ourselves but that sounds like a good idea going forward. I find it crazy how people would pinch pennies and then not pay attention to the thousands going to their mortgages, insurances and home improvements… you can win big if you are smart with your house finances. Interesting. Many of us put more effort into managing our other traditional investments – when as you point out – sometimes our home is our biggest investment and deserves the same attention. This is interesting. I’ve never heard of it, but I will check it out. I love the convenience of renting because it’s completely care free. But we are considering buying a place this fall.